A spork is an eating utensil designed with features of both a spoon and a fork. The overall shape is similar to a spoon complete with a handle and a small bowl-like structure at the end. At the very end of the spork are short tines that are useful for picking up solid food. Also called a runcible spoon, sporks are often provided by take-out restaurants as disposable utensils. They are generally composed of plastic and made through a thermoforming process. Eating utensils have slowly developed over centuries. Early humans used naturally occurring sharp stones to scrape and cut foods. When enough of these were not available, they learned to sharpen dull stones into suitable shapes. These stones represent the earliest known knives. Ancient coastal populations would use shells attached to sticks for eating hot liquids. Other populations used hollowed horns from sheep for similar purposes. These applications of natural products demonstrate the early development of the spoon. Over the years, the design and production of eating utensils became more efficient. Different materials such as wood, ivory and metal were often used. Knives and spoons were the most common types of eating utensils throughout Europe for years. In fact, the term spoon is thought to come from the ancient Anglo-Saxon word "spon," which means splinter or chip of wood. This reflects the fact that by the fifth century spoons were fashioned from wood. One of the earliest known forks dates back to the time of the ancient Greeks. These utensils were larger than the modern fork and had only two tines. By the seventh century, Middle Eastern royalty used smaller forks regularly at the dinner table. In Europe, the regular use of forks was slow to be adopted. The attitude of many people was that food should be eaten with the hands and that forks were unnecessary. It was not until the sixteenth century that forks were widely available and used in Italy. In subsequent years, forks were introduced in France and England. By the mid-eighteenth century, forks had achieved the form most commonly used today. The idea of combining spoons with forks is not new. One of the first patents issued in the United States for such a product was done in 1874. In this patent, a device is described that has a handle, spoon bowl, knife-edge, and fork tines. This is said to be the basic design for all future combination eating utensils. Through the next decades, improved products and materials were patented. One patented design had a deeper bowl and shorter tines that made it useful for eating liquids. Plastics were adopted as the construction material of choice during the 1940s and 1950s. The term Spork was introduced in a patent issued in 1970 to the Van Brode Milling Company. Sporks can be made from all types of materials including steel, wood, glass, and plastic. By far the most often used material is plastic, specifically polypropylene and polystyrene. These materials are combined with other additives to create the finished utensil. It is important to note that all the materials used in spork manufacture are regulated by the United States Food and Drug Administration (FDA) to ensure that they are safe for contact with food. Plastics are high molecular weight materials that are produced from monomers through a process called polymerization. These monomers like ethylene and propylene are ultimately derived from oil and natural gas. In a process called the "cracking process" crude oil or natural gas is heated to convert the constituent hydrocarbons into reactive monomers. For spork manufacture, polypropylene (PP) and polystyrene are often used. PP is produced from a polymerization reaction of propylene monomers. It is said to have excellent chemical resistance and is used for many types of packaging. It is ideal for spork manufacture because it is resistant to degradation by water, salt, and acids, all of which are destructive to metals. Solid polystyrene also shows good chemical and temperature stability. It is made through the polymerization reaction of styrene monomers. Styrene was first produced commercially during the 1930s and was important during World War II as a constituent in synthetic rubber production. In addition to the base polymeric material, other modifiers are added to change the characteristics of the material, improve the stability, and make manufacturing easier. Since the bulk polymer is typically colorless, colorants are added to make sporks more appealing. These may be soluble dyes or comminuted pigments. To produce a white color, an inorganic material such as titanium dioxide may be used. A host of other filler materials are added to produce high quality sporks. For example, plasticizers are added to increase the workability and flexibility of the polymer. Plasticizers are nonvolatile solvents and include things such as paraffinic oils or glycerol. Since the plastic is typically heated during production, stabilizers are also added to protect the plastic from breaking down. An unsaturated oil such as soy bean oil may be used as a heat stabilizer. Other protective materials that are added include ultra violet protectors and antioxidants. These materials help prevent degradation of the plastic due to environmental effects. Finally, compounds such as ethoxylated fatty acids or silicones are used to aid processing during manufacture. These materials make it easier to remove the plastic from the mold. A spork is an eating utensil with combined elements of both a spoon and a fork. It has a handle portion that is gripped by the user. At the end of the handle a small, curved, bowl-like structure is attached an at the very end of this curved structure are small pointed tines. In some designs, inventors also incorporate a sharp edge in the spork so it can also be used as a knife. 1 At the start of spork manufacturing, a plastic sheet is formed through an extrusion process. In this phase of production, pellets of polymer are fed into a large bin attached to a thin, flattened opening. As the pellets are moved through the extruder, a hydraulic screw crushes and melts them at temperatures between 400-550°F (204-288°C) forming a thick, semi-solid liquid. The polymer is pushed through an opening and extruded as a thinned mass. It is then run under a series of water-chilled rollers to thin it further and increase its width and length. At the end of this process, it can be rolled onto large spools or cut into sheets. 2 As with most plastic products, a mold is created for production of a spork. The mold is a steel block with a carved cavity that has the inverse shape of the spork. When softened, warmed plastic is pulled into the mold, it acquires the mold's shape upon cooling. To make removing the spork from the mold easier, special silicon release agents may be used to coat the cavity. When a mold is designed, the cavity is highly polished to remove any flaws on the surface. A single flaw on the surface could be reproduced in the final product thereby ruining an entire production run. Plastic pellets are fed into a hopper and then smoothed out by rollers. A metal stamper cuts out the spark shape. clamped in place. Situated above the mold is a heater that softens the plastic. 4 Air is drawn through a few holes at the bottom of the mold, creating a vacuum. This drop in pressure causes part of the softened plastic sheet to be pulled down into the mold. 5 When the plastic contacts the mold, it cools and hardens. This causes it to maintain the shape of the mold, which in this case is that of a spork. A large metal stamping plate is moved on top of the mold. This cuts the individual spork from the rest of the plastic sheet and also provides an opportunity to emboss a logo or design on the spork handle. The sporks are then ejected from the molds and moved to the next phase of manufacture. The unused plastic is moved to a separate area to be reground and reused. 6 Sporks are sold in a variety of packages. A common method of packaging is to have a spork wrapped in a plastic film with a napkin. 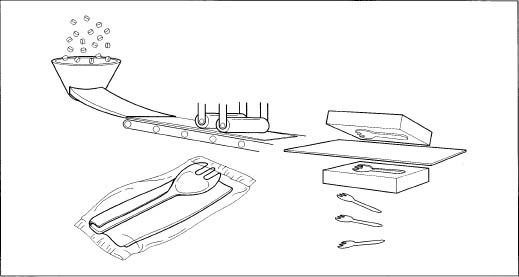 In this case, the sporks are moved to a large holding bin that is attached to a placing machine. A continuous, thin plastic film moves under a machine where a napkin is placed on it. After the napkin is set, a spork is placed on it. If salt or pepper packets are to be included in the package, those are also laid down by another device. 7 Next, the filled film is passed under a folding and stamping machine. This device is designed such that the film is folded over the spork and napkin as it enters. It is then stamped on both ends creating a cut, sealed package. The individual package is then transferred to a storage case. When the case is adequately filled, it is sealed with tape and stacked on a pallet for shipping. Various quality control measures are taken to ensure that each spork produced meets specified standards. These include both laboratory testing and line inspections. Prior to manufacturing, the physical and chemical properties of the starting materials are determined. For example, molecular weight and chemical composition determinations are done on the plastics. Also, visual inspections of the color, texture and appearance are performed. The physical performance properties may be evaluated as well. Stress-strain testing may be done to ensure the plastic is durable. This is particularly important for spork manufacture because the products must be strong enough to pick up solid food. Quality control technicians in a laboratory generally do this testing. On the manufacturing floor, line inspectors are placed at various points along the production line. They visually inspect the plastic utensils making sure the size, shape and colors are correct. They also check the products in the final packaging ensuring that each spork shipped is of an acceptable quality. When defective sporks are found they are taken out of the production line a set aside for reforming. In the manufacture of sporks, the primary waste product is unused plastic. The disposal of this material is managed through a system that includes source reduction, recycling, waste-to-energy conversion, and landfilling. During the manufacture of sporks, source reduction is the primary method for reducing plastic waste. This is achieved by reusing plastic from misshapen products. The other phases of waste disposal address the finished products themselves. Since sporks are designed to be disposable they are destined to become waste. Some of this waste ends up in the recycling system and gets used for different recycled product applications. Other parts of this waste end up being used in incinerators to convert it from waste to energy. During this energy conversion, a polymer like polystyrene produces carbon dioxide, water vapor, and trace amounts of non-toxic ash. The final resting spot for many disposed sporks is in landfills. In the future, spork manufacturers will likely concentrate on improving production efficiencies and increasing sales. From a production standpoint, research is focusing on increasing manufacturing speeds, reducing raw material costs, and minimizing chemical waste. For example, one raw material supplier has introduced a plastic substitute made from wheat gluten resin that is durable enough for spork manufacture but is also biodegradable. Another supplier has introduced a soybean product that has similar characteristics. To increase sales, spork manufacturers will focus on getting more fast food restaurants to use their product. Sporks present an opportunity for these restaurants to cut costs by eliminating the need to carry both spoons and forks. Chabot, J. The Development of Plastics Processing Machinery and Methods. Society of Plastics Engineers, 1992. Giblin, James Cross. From Hand to Mouth, Or, How We Invented Knives, Forks, Spoons and Chopsticks, and the Manners to Go with Them. New York: Crowell, 1987. Albanese, Joseph. U.S. Patent 4,984,367 Combination Utensil. 1991.